A low fat scotch pie that has been endorsed by Scottish Slimmers has been officially launched today at Scotmid Co-operative stores across Scotland. The McGhee’s reduced fat scotch pie, produced by McGhee’s Bakery of Glasgow, has nearly half the fat of a standard scotch pie. The pie is also lower in salt and is now within the government’s healthy eating guidelines for salt content. The McGhee’s production team has worked hard to ensure that the reduced fat scotch pie looks and tastes just as good as the traditional version. 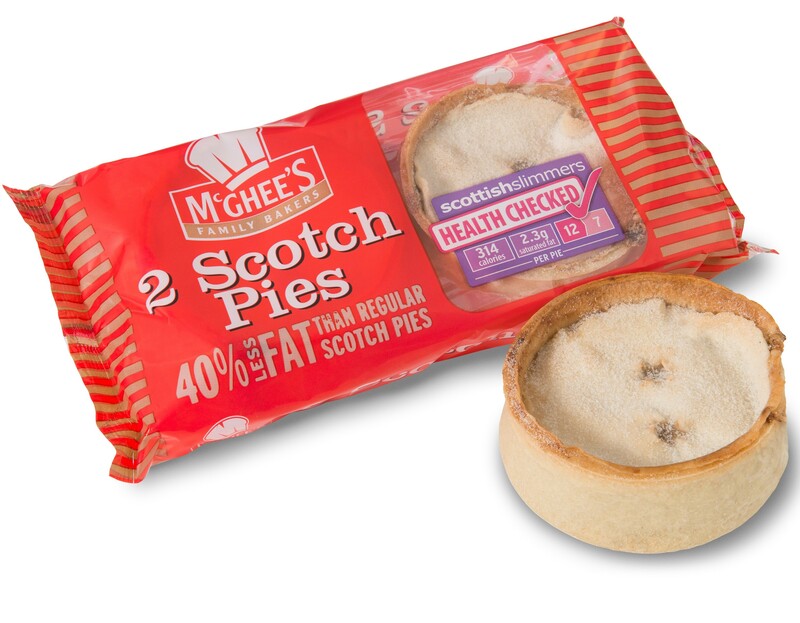 The pie’s healthier credentials have earned the product a ‘Health Checked’ stamp of approval from Scotland’s weight loss experts Scottish Slimmers, whose members taste tested the pies during their development. The healthier scotch pie is approved by Scottish Slimmers. Jennifer Polson from Scottish Slimmers said: “Scottish Slimmers members are always interested in eating healthier versions of their favourite foods and the McGhee’s reduced fat scotch pies proved an instant hit with those who tested them. 46% of our members told us they had decided to stop eating scotch pies altogether while they were losing weight so, now, thanks to these lighter, tastier pies they can enjoy a Scottish Slimmers style scotch pie supper with the rest of their family any time – and still get a weight loss!”. The pie will be on sale in Scotmid stores for £1.35 for a pack of two pies. Each scotch pie contains just 2.3g of saturated fat, 1.2g of salt and has 314 calories. McGhee’s is one of Scotmid’s local suppliers. Scotmid is committed to supporting Scottish businesses in the food and drink sector. Pictured above: Stephen Brown, Local Sourcing and Bakery Manager for Scotmid Co-operative, Gill Duncan, Class Manager for Scottish Slimmers, and Ross Hamilton, Sales Manager for McGhee’s Bakery.